After two weeks of almost incessant rainfall, Istanbul awoke Wednesday to a surprise snowfall. For the first time this winter, a thin blanket of snow covered the city's western parts of Beylikdüzü, Büyükçekmece and Çatalca first before heading to the more populated eastern and central parts, including higher ground on the city's Asian side. The snowfall was brief, much to the chagrin of residents who had the opportunity of taking selfies before the precipitation receded and was completely gone by the evening. Traffic briefly slowed down on the D-100 highway, a major route straddling the city, due to low visibility. Residents of northeastern Turkey have experienced snow this year, while capital Ankara got its first snowfall Tuesday night. Precipitation picked up speed in the early morning, blanketing higher-elevation spots in the capital. Transportation was slowed by the snow and traffic officials attempted to ease transportation by directing drivers in heavy traffic areas. 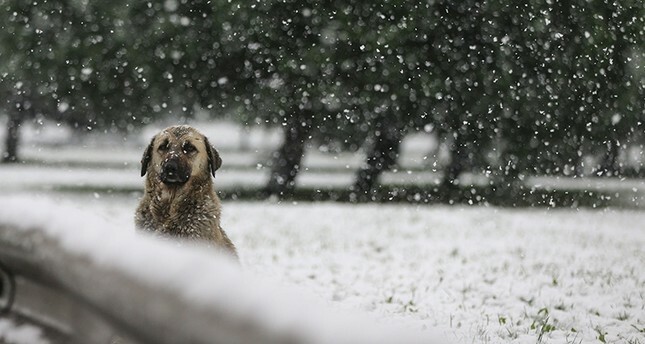 The snowfall is expected to continue in Ankara throughout Wednesday, Turkey's General Directorate of Meteorology said. Weather forecasts for Istanbul show temperatures will remain low and a weather pattern with rainfall is expected to affect the city starting Friday. The lowest temperatures were 0.4 degrees Celsius (33 degrees Fahrenheit) in Arnavutköy in the city's west. The Marmara region is predicted to experience a temperature drop of 2-4 degrees Celsius, with snowfall expected in the neighboring Kocaeli and Sakarya provinces along with the higher-elevation sections of Istanbul. Temperature drops are expected across the northern, western and central parts of Turkey, the directorate said. Istanbul, Turkey's most populated city, will go experience a relatively warm winter this year, meteorologists say. Speaking to Demirören News Agency (DHA), Adil Tek, head of Kandilli Observatory Meteorology Laboratory, the main official weather agency for the city, says temperatures will be above the seasonal norm in January, February and March, with low a possibility of snowfall. Tek says rainfall will be dominant instead, mainly a rainfall pattern hailing from the Central Mediterranean region.